I loved Matthew Kirby’s The Clockwork Three, so when I saw Icefall come up on the Lovelace nominee list I was thrilled! The book cover seemed to indicate the story would take place in a bleak northern landscape with fjords and Viking warriors–maybe Norway hundreds of years ago–and somehow I got the impression from the book jacket summary that the story was going to be as bleak and slow-moving as the cover art. I figured I would force myself to read a few pages before bed to start and wound up realizing at 2am that I should probably try to sleep a little. Icefall is a compelling story that definitely pulled me back to the book whenever I had a few minutes to read. Our main character is Solveig. She is the middle child of the King, having a beautiful older sister, Asa, and a young brother who will inherit their father’s crown, Harald. At the opening of the novel Solveig and her siblings (along with a few members of the royal household) have been sent to a small stead far from their kingdom in order to keep them safe while their father fights a war. When Solveig’s father sends his Beserker Guard and their Chief, Hake, to join his children in their hiding place for protection Solveig and the others are appalled. Icefall manages to weave a pulse-pounding adventure of traitors and betrayal, loyalty, friendship and the discovery of our own unexpected strengths parallel to a story about the power of stories. When Solveig begins to train with Aldric, her father’s skald (storyteller), she learns both the mechanics of telling a story and the qualities of stories themselves. Solveig’s abilities reveal new truths about stories and their vital role in our lives to herself AND to Aldric. Along the way Solveig experiences the pain and shock of betrayal as well as the warmth of true friendship and love. She learns truth, deception and love can be difficult to sort out in our lives, especially when we have been hurt and do not believe in ourselves. I found this book to be a superbly moving read on many levels. I fell in love with Solveig almost right away, and with many of the others through her. Icefall does not have an engaging cover or a super exciting book jacket blurb so young readers may need a little push to start this one. 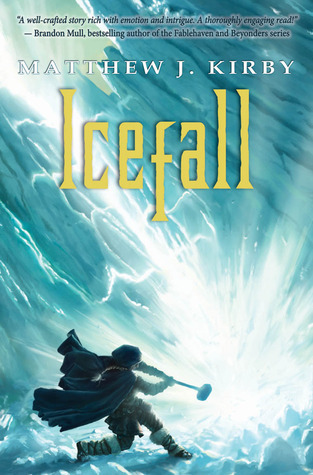 Once started, Icefall is difficult to put down. For these reasons Icefall might be a great read-aloud choice at home or in older elementary and middle school classrooms.